"The Daytona Slimline is a titanium yoyo that pays homage to the modified shapes of yesterday. Based on yoyos such as the Playmaxx Cold Fusion GT and Ace, it brings back a flavor of fun - and in full titanium. The slim shape means it can be comfortably carried in your pants every day and the raw finish means you don't have to worry about scratching anodizing off! The perfect every day carry companion. Each Daytona comes with a thin and thick bearing. Swap in the thin bearing for instant responsive play. Tug responsive to the point that basic looping tricks are possible! Switch back to the unresponsive full sized bearing and you have a nimble 1A yoyo. be-warned that the thin profile makes hitting your tricks more difficult, perfect for honing in that combo you've been practicing for months." The model in this exhibit has an AMS2488 Type II coating over the titanium. AMS2488 is an SAE (Society of Automotive Engineering) coating that is used as a dry lubricant. Its surface is very slick, comparable to that of Teflon. Original retail price: $330 US for AMS2488 Type II finish. Most people who are in this hobby have had many yoyos. Especially the demographic that buys my stuff - they are usually a lot like me in that I bought, sold and traded a lot. I'm pretty sure the reason why I have any talent at all in designing these throws is due to the sheer amount of yoyos I have owned in the past. But for most, there is usually one yoyo that you remember - that one that you first bought. The one I wanted most got away. My real first was a white Yomega Fireball almost 14 years ago. It had a transaxle, starburst response. I didn't really know about "yo-yoing" as I do today, but it was enough for me to learn the basics. I was hooked, and couldn't put it down. I had that yoyo for a few months before I saw something incredible at my local hobby store: The Yomega RBII. I had never seen a yoyo with a ball bearing before but at 17$, no matter how much begging, my parents said it was "too expensive for a yoyo you'd play with for a few months and grow out of". I laugh at my mom now, both at the price and the growing out of part. I never ended up owning one even to this day. Because of how limiting that Fireball was yo-yoing slowed down a bit until Youtube became a thing. I saw a Japan nationals contest video and the rest was history. My first "real" yoyos were a yellow Kickside and a green Spinfactor HG. But I always wondered what would have happened if my mom caved in and bought that RBII for me a year earlier. Heck I'd probably be Gentry Stein by now. Regardless, that one yoyo, the RBII always stuck in my head. Black sheen, perfect proportions. For whatever reason it always just looked aesthetically "right" to me. The thickness of the ring, the way the profile curves into a sharp edge before the instant flat undercut. As mentioned, I have still never owned or thrown one. Maybe its better that way - never meet your heres kind of thing. The Daytona Slimline is a clear variant of the RBII, but also takes elements from a lot of these more modified shaped yoyos that were popular along side butterfly yoyos during my first few years of throwing. I remember even on Dave's Skill Toys, or YoyoGuy where there would be a "modified" shape designation, essentially a yoyo that was somewhere between butterfly and a looper. I haven't even heard that term in the past 5 years. These were not gigantic super wide pop cans that we now call modern yoyos, but slim, easy to use and less intimidating for the general public. In a way, the designs didn't seem to try as hard to be cool as they do now - they still looked like toys. I took more inspiration from things like the Proyo Ace. In fact the Evora nub was inspired by the Ace, and with this yoyo its nearly a blown up version with its round modified shape curving into that flat undercut. 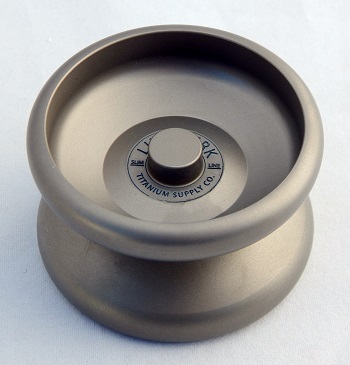 Another yoyo that shared a similar design was the Cold Fusion GT with its larger High Wall. A lot of these legendary yoyos were stepping stones to what we have today - which I tried to pay respects to with this homage. Everything about this new yoyo is focused on two things - having fun and being pocketable. This is why the Daytona includes a slim bearing for responsive play. It should be something you can give to your grand dad who hasn't played with a yoyo in 45 years. I genuinely hope that this run of yoyos is out getting played, getting smacked around and used every day instead of sitting on a shelf. Staying on the fun theme it was important that a slim bearing could be installed. The large nub concentrates mass in the centre of the yoyo - helping it loop easier. At 62.5 grams, the lighter weight makes it much easier on the wrists as well. Of course they don't loop as well as a dedicated pair of looping yoyos but a production titanium yoyo with any looping capabilities? Perhaps a world first. With the responsive slim bearing installed expect snappy re-gen performance, busted knuckles and style honing snagginess. Its how my personal Daytona is set up for my EDC (Every Day Carry). In short, this little project has been a dedication to how things were before - my take on the current slimline craze. It wasn't long ago that what we now consider a novelty was just what people called a regular yoyo - many easily forget, including myself."